Where to live is one of the biggest decisions that retirees face. For many people approaching retirement, the decision between keeping the family home, downsizing to a smaller house or condo, or ridding themselves of the stress and expense that can come with home ownership altogether is a difficult one. Here, we'll provide you with the points you should weigh to make this decision for yourself. What is your budget for renting or ownership net of taxes? Have you thought about the risks associated with ownership from the standpoint of unexpected costs and can your budget tolerate them? To begin, the first step in analyzing ownership versus renting is to determine how much money you want to spend net of taxes. Because mortgage interest and property taxes on a primary residence are tax deductible, knowing after-tax cost is essential. Fortunately, the math is very simple and is explained below, which arbitrarily assumes an after-tax budget of $2,000 for mortgage interest, taxes and insurance for home ownership, or for rental costs. Because rental costs are not tax deductible, no calculations are required. However, taxes complicate the situation for ownership in that you can spend well in excess of $2,000 every month but still only end up paying $2,000 when you get your tax refund. Essentially, all you need to do is determine your marginal tax bracket, deduct that percentage, and divide your budget by that amount (see table below; assumes a 20% marginal tax rate). The table shows that if your budget is to have a net after-tax cost of $2,000 and your marginal tax rate is 20%, you can spend $2,500 per year on mortgage interest and property taxes. Keep in mind that you need to foot the pretax bill until tax refund season. As such, your cash flow situation needs to be taken into account as well. Obviously, home ownership has a distinct advantage in that you can theoretically get more for your money. However, there is no free lunch because home ownership also entails substantial financial risks. Such issues as fluctuations in market value, expected/ unexpected maintenance expenses and insurance deductibles can comprise huge additional costs over and above renting. Nonetheless, once you've done the math, simply go shopping for homes, mortgages and rental properties that fit within your budget. And don't forget to plan for inflation; rents, taxes and insurance costs all go up over time. Even though homes and condominiums can be good investment opportunities, these assets shouldn't be examined solely from that perspective. The fact of the matter is that housing is an unavoidable cost of living. From a conservative point of view your home should be best considered a cost of living as opposed to an investment asset. This is because investment assets shouldn't involve finding another place to live as a means of providing liquidity. Therefore, from a retiree's standpoint, it would be best to ignore the investment upside of ownership in your thought process. It will distract you from the real goal of appropriately planning for your retirement housing costs. Nonetheless, if you see your home as an investment, a general rule is very simple: buy low and sell high. This means buying and selling homes opportunistically. Keep in mind, however, that in some ways, renting can be considered the economic equivalent of shorting a stock. For example, if you believe that housing prices are headed lower, you would rent a home, wait for prices to fall and buy a home later. This strategy reaps the benefits of going short through lower housing costs. If you're wrong about the direction of housing prices and you end up paying a higher cost of housing when you do buy, this is similar to paying a higher price for a stock to cover your short position. 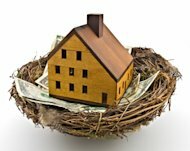 This is the main thing a retiree should be worried about in using a primary residence as an investment. By selling your home, you take the chance of becoming priced out of the market if prices increase instead of going down. This should be a big concern if you are on a fixed budget and enjoy owning your own home or condo as opposed to dealing with a landlord. Another major issue to examine is the maintenance risk associated with ownership. This is important because renting is the same as buying an insurance policy against maintenance. What this means is that renters have no liability for regular maintenance costs, equipment failures, or catastrophic occurrences such as a tree falling on your home or being hit by a storm. The beauty of renting is that the landlord has to worry about the unexpected financial costs of ownership. Other financial benefits of being a tenant are that you don't have to worry about market conditions in case you move, and there is no possibility of an investment loss. Moreover, as a tenant you don't need to worry about liquidity. Selling a home can take a long time; it also involves lots of paperwork. Furthermore, most real estate agencies charge a commission. Sidestepping this mess when it's time to move can definitely be worth it. Additionally, retirees often live solely on pensions such as Social Security or a corporate plan. However, they don't always have large sums of liquid net worth. If you don't have sufficient assets on the sidelines to pay for unexpected expenses, the regular costs of owning a home could be ruinous. On the other hand, if you have enough assets on the sidelines to tolerate the unexpected costs of ownership, then maintenance risks really shouldn't be a large a concern in your deliberations. Decide whether you are looking to make an investment or just budget a cost of living. Figure out what you want to spend after taxes, and do the math to determine your budget for renting and ownership. Seriously consider how much risk you're willing to undertake. Do you want worry about market prices? Can you afford the financial risks of maintaining the property? Keep in mind that there is a direct relationship between the size of your liquid assets and your ability to tolerate the financial risks associated with ownership.